The Metal Giants and Others launches in style the multi-volume program to collect all the prose work of a neglected, but fondly remembered master, Edmond Hamilton. Culled from the highly collectible (and highly priced!) 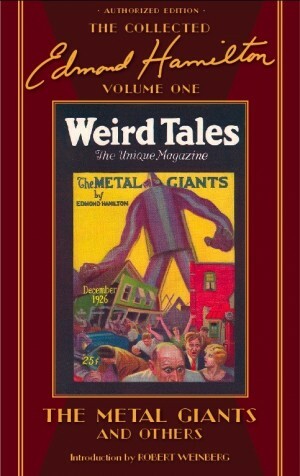 early issues of pulp magazines such as Weird Tales, Amazing Stories, and Science Wonder Quarterly, these tales seethe and foam with the vigor of unrestrained imagination. Hamilton had yet to earn his (sometimes undeserved) reputation as “World Wrecker” or “World Saver” when these stories were published, but as these tales show — he was well on his way. In this volume, the Earth is threatened countless times, but one lone hero (usually a genius-scientist) stands between triumph or total annihilation. The influence of A. Merritt and M.P. Shiel is felt in several tales of lost, exotic lands, and Hamilton himself begins to exert his own small influence on the genre with several stories of temporal dislocation and cosmic menace. Author, editor, bookdealer, art collector (and co-owner of Weird Tales, Ltd.) Robert Weinberg delivers an introduction with details on the history of early American science fiction, the context of these stories in relation to their contemporaries, and his own personal memories of knowing — and publishing — Edmond Hamilton.